BEREA, OH – The previous weekend’s Kid’s Fishing Derby at Wallace Lake had me wondering if there were any stocker Rainbow Trout remaining. If you read my previous post covering the event, you will know I did not give the fishing it’s due effort, which also left me feeling a bit bummed. I was hopeful fish would remain, but also knew the lake would have had considerable pressure. With an opportunity to fish nearly all of the day, I was fortunate that my plan could include multiple destinations. 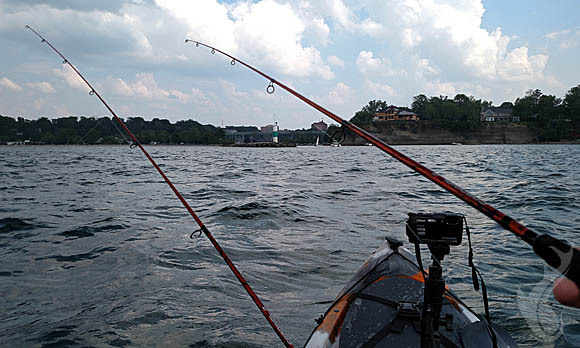 I decided I would fish Wallace Lake for a few hours before moving on to the Rocky River at Emerald Necklace Marina and then into Lake Erie. Getting on to the water at Wallace Lake, I was greeted with a nice Bluegill on my second cast. This didn’t end up meaning anything as to the pace of the fishing as I would go nearly an hour and a half before the next strike. That strike turned out to be a small Largemouth Bass. Fortunately, I got this bite or I may have been out of the water by the time I hit the two hour mark where I had planned to leave. As I fished on, I began to convince myself that it was unlikely many fish remained. The lake is not so big as to not see a good number of shore anglers at any given time, and I had not seen a single trout taken by anyone. I am not sure what motivated me to keep throwing my inline spinner and revise my departure time, but I did. Finally, I got another hit and felt the pull of a bit better fish than the previous two. 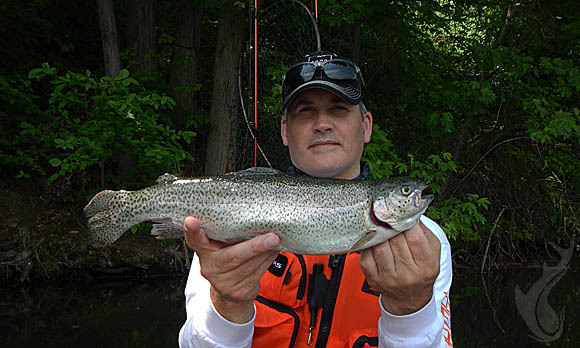 As I got the fish close to the boat I could see it was a trout, and a fine sized one for a stocker. Fish landed without issue, just under 17″. With goal number one for the day accomplished by catching a trout out of Wallace Lake, it was on to the next missions. While not so specific, I just wanted to catch some fish in the Rocky River and Lake Erie. I headed north through the Rocky River Reservation and put the kayak in at Emerald Necklace Marina. The river was pretty busy with boat traffic, both large and small crafts. Who knows if this contributed to keeping fish out of the area but I had no hookups, just conversations with other paddling enthusiasts. Moving on to the lake, my luck didn’t change. All of my offerings were refused other than drifting worm harnesses that were getting destroyed by Round Gobies. I landed a few of them to confirm what species was bait robbing me, and gave up on trying to get anything else to bite. The weather changed too, and I called it a day. I wish the river or lake would have given up a nice fish or two, but I was happy I got out, and I always get ideas for the next trip and how to be more successful.